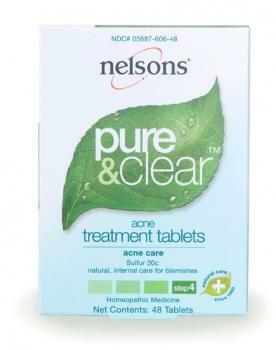 Keep Nelsons Pure & Clear Acne Treatment Gel on hand to target blemishes immediately. Nelsons Pure & Clear Acne Treatment Gel is an effective formulation of the four main ingredients with the addition of Sulfur to alleviate red inflammation around the outbreak. How to use: Apply directly to affected area as often as required. Expert Tip: You can plan almost everything except the weather and getting a blemish just before an important date! If you are struck with an unsightly blemish as you stumble out of bed and gaze into the mirror, don't panic. Wrap an ice-cube in cotton and hold against the skin to quickly reduce swelling and redness. Follow with the application of Acne Treatment Gel under your make-up, so the formulation can get to work immediately. Continue with applications throughout the day. Inactive Ingredients: Water, Alcohol, Tea tree oil, Trolamine, Carbomer, Limonene (tea tree oil source), Linalool (tea tree oil source). For the relief of Acne, Pimples, Blemishes. Active Ingredients: Extract of organically grown Arnica montana tincture 2.5% v/w, Calendula officinalis tincture 2.5% v/w, Hypericum perforatum tincture 2.5% v/w, Sulfur 6x 1.5% v/w. Other Ingredients: Alcohol, Carbomer, Methylparaben, Purified Water, Tea tree oil, Trolamine.